Many of you have asked about what the Covenant Kids Congo and Paul Carlson Partnership team experienced in Brussels after the terrorist bombings on March 22nd. We are deeply grateful for your prayers, and we are thankful to be safe. Today we’re sharing a little about that experience and what we took away from it. While it was challenging, we want to stress that we were well cared for. What we experienced was so minuscule in light of everyone who suffered on this day, including those who were injured or killed in the attacks. We mourn for those who suffered from these attacks and other tragic events in our dark world. Donn Engebretson, James Fischer, Catherine Knarr, and Greg Kreiger. 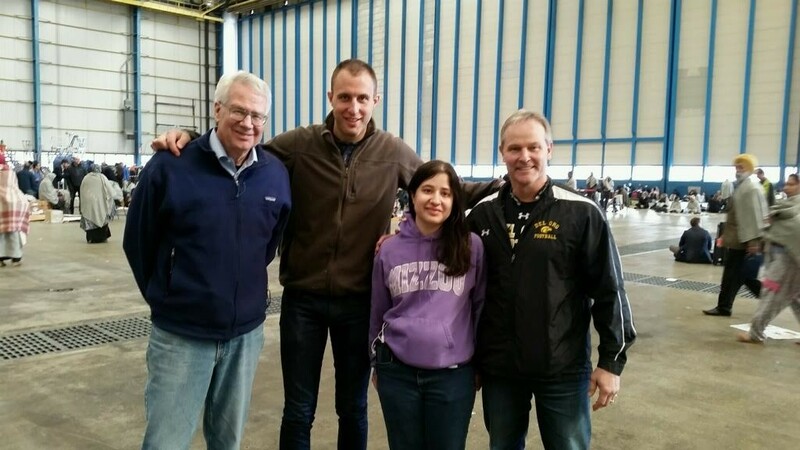 When the bombs went off in the Brussels airport, James Fischer from Paul Carlson Partnership was inside the terminal, and CKC Project Leader Donn Engebretson, CKC Project Manager Catherine Knarr, and Covenant Pastor Greg Krieger were on a plane that had just landed in Brussels. All four of us had a layover in Brussels on our way to Congo. CKC planned to film new videos showing the impact of child sponsorship, while PCP was preparing to restore the Zulu hydroelectric dam powering the hospital in Karawa. The terrorist bombings disrupted those plans in a way that we’d never expected. Before leaving for the trip, we had talked about the upcoming elections in Congo and any related security concerns. But we never considered that something might happen during our brief layover in Brussels. Inside the airport, James Fischer heard a warning to evacuate over the intercom, but no one knew where to go. Then a police officer came running and yelling for all to leave, leading everyone outside to the tarmac. James saw very shaken people running behind who had debris in their hair. They appeared to have been close to the explosion. When the plane landed in Brussels, Donn, Catherine, and Greg didn’t know what was happening inside the airport—until the pilot announced that there had been a security problem. The next announcement revealed that it was an explosion. Eventually, busses came to transport passengers to a secure hangar, where the team was reunited with James. 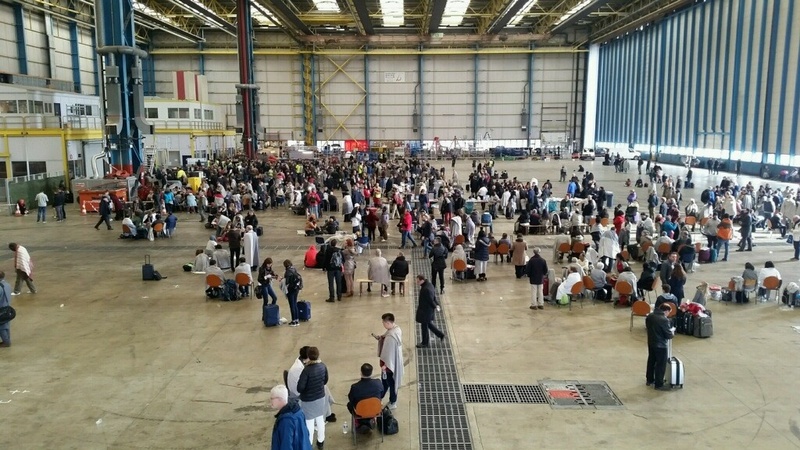 For the next seven hours, we and about 1000 stranded travelers stayed in the hangar and awaited updates. The airport was shut down, and we weren’t going anywhere soon. But airport security workers provided blankets, water, and food. In the evening, busses arrived to take stranded travelers to a large music hall staffed by the Red Cross. It was there that we spent the night. The Red Cross worked very hard to take care of us, providing dinner, breakfast, and about 500 cots for travelers to sleep on. During the evening and next morning, we sat around our table, weighing our next steps. Every once in a while, other travelers would wander by our table. That day, we talked to people from all over the world—Rwanda, Norway, Brazil, Poland, Senegal, and Hong Kong—who were thrown together in this intense situation. One couple had been going through security when the bombs went off and were knocked off their feet. Some people were frightened and stressed. But no one complained. A young woman from South America sat down with us, and soon we started talking. As a student at a local university, she was not far from “home” in Belgium—and yet she couldn’t have been farther, as she was completely alone. Forced to abandon her purse during the evacuation, she had no money, ID, or phone charger. In tears, she told us that she had no idea how she was going to get home. We happened to have local Covenant pastor Steve Swanson on the phone, and he asked to speak to her. When Steve told her that he would give her a ride to the train station and money for her fare, she thanked him profusely. Wiping the tears from her face, she continually apologized and explained that we were the first ones who had paused to help her. Before Steve arrived, her airline offered to take her to her final destination, and then she was on her way. But we will always remember that powerful moment of comfort and relief. Meanwhile, Steve Swanson picked us up from the hall, and he and Covenant missionary Barbara Swanson welcomed us into their home in Antwerp. We were so grateful for Steve and Barb’s thoughtful hospitality, prayerful comfort, and assistance as we navigated our travel arrangements. They did everything they could to help us each step of the way. By God’s grace, we still completed our purposes in Congo. At first, we weren’t sure if we would be able to make it, since Brussels airport would be closed for days. Then we actually managed to book a flight out of Frankfurt, but it later seemed to vanish from the system. On a leap of faith, with amazing help from Steve and Barbara Swanson, Donn, James, and Greg took a train to Frankfurt in hopes that the airline would be able to find their missing flight and fly them to Congo—and it worked! Meanwhile, Catherine headed to Amsterdam to fly home and be with her family, in hopes of continuing to Congo another time. In Congo, our Covenant missionaries rebooked the Mission Aviation Fellowship flight so that Donn, James, and Greg could fly from the capital to the northwest province. They also prepared to receive a team that had lost all of their checked baggage and needed to work with a shortened schedule. By God’s grace, James made great connections for the work of Paul Carlson Partnership, and Donn and Greg were able to get critical video work done to advance the ministry of Covenant Kids Congo powered by World Vision, while making wonderful connections with Covenant World Mission. Ultimately, as we reflected on this experience, we were humbled by the prayers and the care we received, and we were reminded how critical the work in Congo is. In a rare moment, we encountered the repercussions of evil and brokenness in our dark world, and we recalled the hope of Christ. As a country, the Democratic Republic of the Congo has been through so much, from the tragic history of brutal colonialism and mass slavery, to violent wars, to the abusive way that western powers have exploited its resources and left its people in extreme poverty. The people of Congo know what it means to encounter evil and brokenness, and yet they are hopeful. Because if there is one thing that can defeat evil, it is the hope of Christ. And this hope that we hold becomes transformative as we work together for a better future. Our friends in Congo are doing the hopeful work of rebuilding their country. Let’s stand with them in hope for brighter horizons in our world. For more information about Covenant Kids Congo and Paul Carlson Partnership, visit their websites at www.covchurch.org/covenantkidscongo and www.paulcarlson.org. Posted in Congo travel, News, PCP Update, Personal Stories.